To state it simple, more or less we have understood that the propagation on amateur radio bands, especially those in the HF range, depends on the quantity of sun spots (Sn, Sunspots number): more the sunspots (higher Sn) means better propagation of electromagnetic waves and higher maximum usable frequency (MUF). The wise Old Men tell us that this sunspots number or, better, its daily and monthly mean, in the long term has a cyclic trend, that is it reaches a peak in a relatively short time, and then it has a long decay, which lasts several years, with a low sunspots number resulting in mediocre propagation. Such a trend, is recurring roughly every eleven years as we observe in the following chart showing the monthly mean susnspots number in the latest five cycles. Poor us, we are now living the long low sunspots tail of the 24th solar cycle - few sunspots, low propagation… What we all wonder is: when the sunspots number is going to grow again? 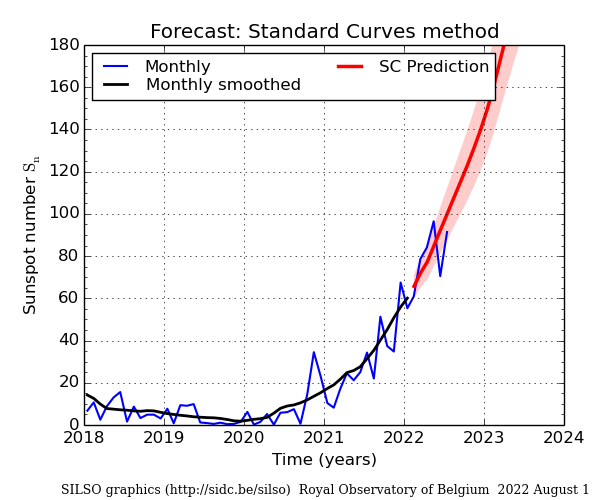 In other words: When is the new solar cycle going to begin? And, even more interesting: When is the propagation going to improve so that we could finally have DXing from our normal QTHs, with affordable power and antennas? To answer those questions, we get some help from the predictions published by prestigious research institutes. Above: predictions dated 2019 January 8; below predictions udatrd monthly. 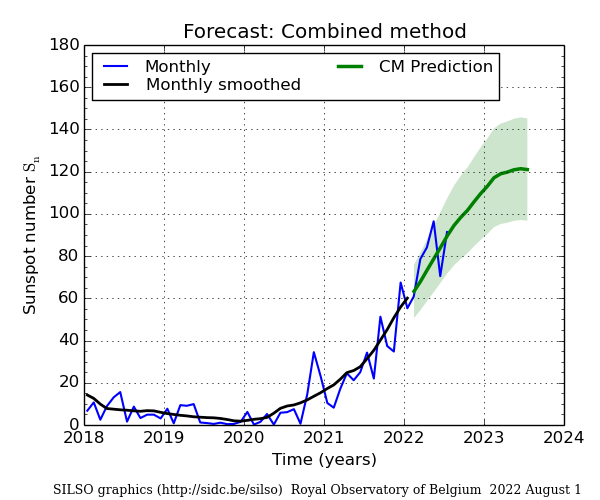 Credit: SILSO data/image, Royal Observatory of Belgium, Brussels. With great sadness I am reporting that, after a long fight against illness, on December 30th, 2018 Steve, G3TXQ passed away. Steve was, and still is a very popular radio amateur all over the world for various reasons. Here, I want to remind all of us his dramatic inprovement of hex beam antenna and his hard work about baluns. His death is a tremendous loss to the world wide amateur radio community. I offer my condolences to Steve's family. There we were. October 2009, operators in the radio shack Direzione Comando e Controllo, Guardia di Finanza. Coppito (AQ). Greetings to my friends from Friuli Venezia Giulia (ARI Udine and Monfalcone, if I remember well) and to my friends from Piedmont, ARI Turin. At best of my knowledge, starting on November 3rd, 2018, italian radio amateurs will be allowed to transmit on 60m band with maximum 15 W e.i.r.p., from 5351.5 kHz to 5366.5 kHz. Contacts made before November 3rd, 2018 should be neither legal nor recognizable as DXCC credits, records, awards, etc. Italy is on 5 MHz band too! Online DXCC - how much is it? Read more: Online DXCC - how much is it? ik1hge.com is back! After a few years of QRT, ik1hge is on line again. IK1HGE is looking for QSL cards. PSE QSL!